Fruits are healthy, but you will love them more when they start winning you money. 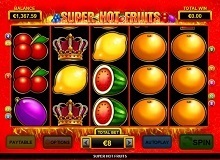 Super Hot Fruits is a fruit themed slot machine created with a Vegas style. This game was created by Inspired Gaming developers with 5 reels, 3 rows, and 10 paylines. The reels are quite large, and they lie against a background of fire and heat. The design is high quality, and the interface is simple and user-friendly. The game has been optimized for all types of devices and thus playable on both personal computers and mobile devices. 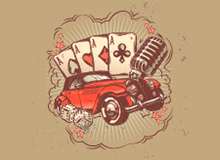 Players can, therefore, have fun and win rewards anywhere any time. The best way to feast on fruits is by playing Super Hot Fruits for real money. The betting range is wide enough to fit both high and low rollers. The minimum amount to bet per spin is $0.10 while risk takers can bet to as much as $100. Use the ‘Total Bet’ button to either decrease or increase the bet amount. The paylines are fixed, and thus one has to play with all of them. Start playing by pressing the ‘Spin’ button. The game also features an autospin feature used by players to play continuously without pressing the spin button. The games jackpot award is $250,000. 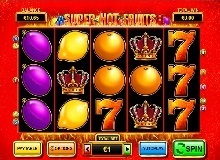 The rules of the game are very simple, and new players will not have a challenge when learning Super Hot Fruits slot. A win is given when you match three, four or five similar symbols on a paying line. The matching icons must be on adjacent lines. If the player gets several winnings on one payline, they will be paid with the highest win. Just like you would expect, most of the icons in the slot are cartoon designed fruits. Low-value symbols include golden bell, cherries, oranges, plums, grapes, watermelon and lemons which pay between 20x and 200x the players bet. Symbols with big cash rewards are the royal crown and lucky number sevens. A player is rewarded 250,000x, 50,000x and 10,000x their stake, when they land 5, 4 or 3 royal crowns on a paying line. Five, four and three lucky number 7 awards the player 50,000x, 20,000x their original wager. The RTP during the base game is 94%. Wild IconThe wild symbol in Super Hot Fruits casino slot online is represented by a blue icon with the word ‘Wild’ on it. The wild symbol only appears during the bonus round. It will appear only on the third reel. It replaces all the other icons on the reel to finish a rewarding combination which leads to more wins. 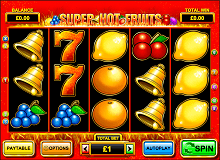 Super Hot Fruits free game can be played at various casinos online. The slot has a high volatility, and thus the player should expect huge payouts once in a while. The mobile-optimized version is compatible with almost all devices. The game with a colourful paytable, amazing gameplay and simple but effective graphics are worth your time. There is a setting available to mute the background sound, but this may not be required since the soundtrack is tolerable.